Musical Theatre and even Pre-school! When you dance, the purpose is not to get to a certain place on the floor. 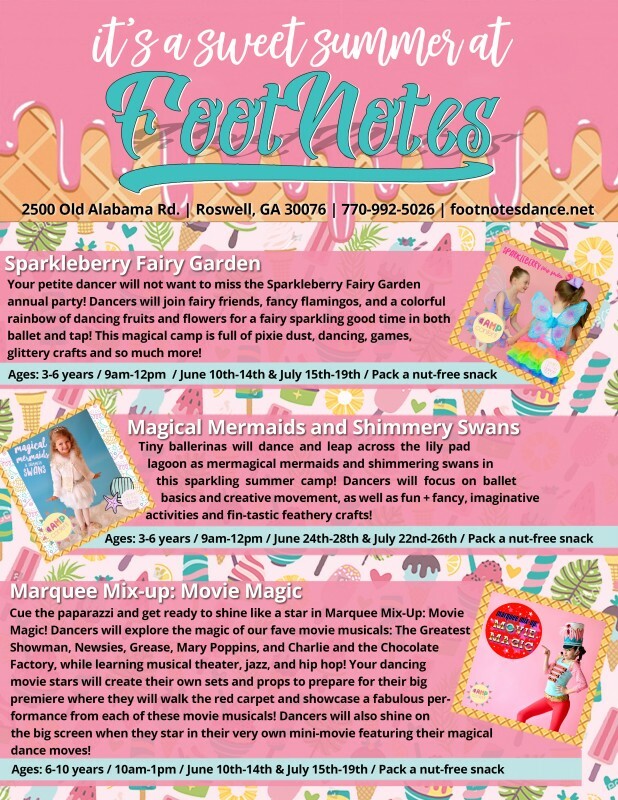 It's going to be a sweet Summer at FootNotes! 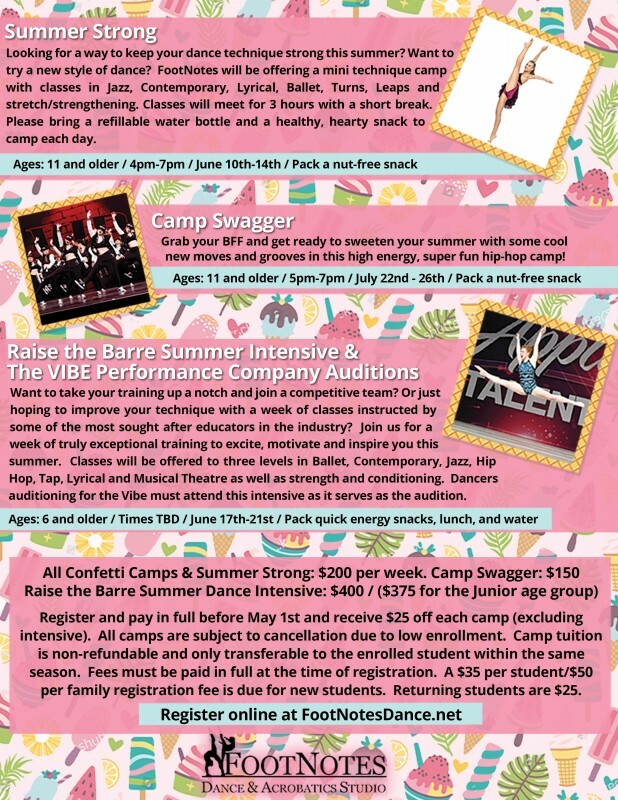 Summer program registration begins Monday, March 18th. At FootNotes, you are sure to find a shoe that fits! Celebrating our 18th season with over 60 classes each week, we’ll help you find something you love. 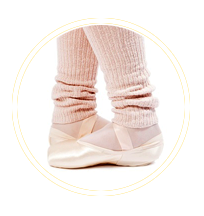 We offer nurturing classes for young beginner dancers and more serious programs for the more training focused student. for EIGHT years in a row! Our brand new facility was built in 2013 with safety, quality and convenience in mind. 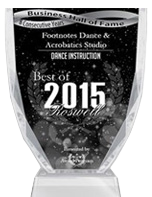 FootNotes has 8,000 square feet with five dance studios and a fully stocked dancewear store. Balanchine true floating, sprung sub-flooring with Harlequin dance surface (commonly referred to as “Marley”). These floors provide the necessary flex to absorb impact and prevent injury. Fixed mounted Ballet barres on two walls; mounted at the appropriate heights. Huge mirrors that go wall-to-wall from the floor to 7 feet in height. State-of-the-art sound systems with wall/ceiling mounted speakers to maximize danceable space. High-definition flat screen TVs to watch your child’s progress during class! 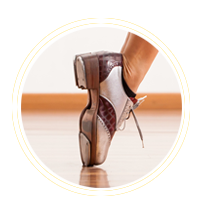 We pride ourselves in offering the very best quality dance school education while serving the Roswell, Alpharetta, Johns Creek, and Milton areas. We encourage you and your family to come by and take a tour of our studio. In the meantime, check out the rest of our website and feel free to contact us if you have any questions at all. Thank you for visiting!